Those of you who have been following our PFS story will know that we were shortlisted for a VIBES Award earlier in the year, which was followed by a site visit from the judges in September. The VIBES award category we entered was for a “Changing Behaviour Award”, which focuses on how your company has changed its behaviour to be more environmentally friendly. The visit went well and the judges were impressed with how much we had done in such a short space of time. We also got some good tips from them regarding things we could do in the building, like reporting our energy usage back to our tenants, and making he signage on our bins clearer which was useful. 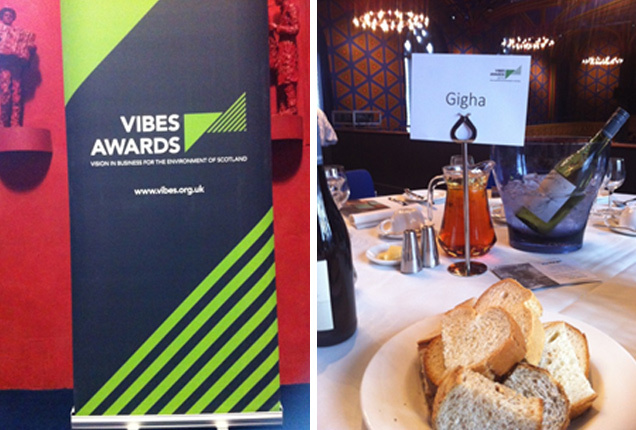 As a shortlisted company we were invited along to the award ceremony, which was held in The Hub in Edinburgh. This was an excellent opportunity to see what other likeminded companies were doing, as well as being a lovely day out! We were up against some pretty big names, like William Tracey, Vegware and Water Aid so we were delighted to have made it to the shorlist. Although we didn’t win in our category, we were really pleased to have made it that far, in such a short space of time and we were also quite impressed with our certificate, which is now hanging in our foyer for all to see. Roll on next year and another chance to win!